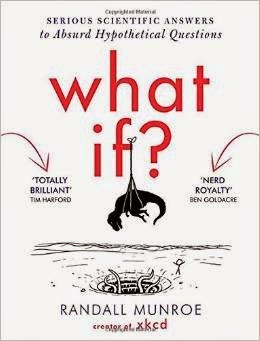 I am deeply suspicious whenever a book is sold on the basis that its author is in some sense famous, so I was immediately wary of Randall Munroe's What If, especially as the book was plastered with references to his internet science cartoon site xkcd. The press release gets even more excited, proclaiming 'Science's most intriguing questions answered by the web's favourite writer, the genius behind XLCD.com.' Damn him with faint praise, won't you? This isn't helped by the fact that the few times I've seen Munroe's stick cartoons, usually re-spread on social media, I haven't found them at all funny. So it was almost a disappointment when I discovered that I really liked this book. The answers given are light hearted, but take the challenge seriously and with some impressive back-of-an-envelope calculation and a touch of research deliver convincing answers. There is a distinguished precedent in taking absurd suggestions (admittedly self-generated) and using them to explore the realities of science in George Gamow's classic (if now rather difficult to read) Mr Tompkins books where, for instance, he explores what would happen if the speed of light reduced to a walking pace. The main problem with Gamow's books is that they suffer from an excess of whimsy, which was considered funny at the time, something that Munroe does occasional succumb to in his footnotes. Two other slight problems with What If are that some of the problems are so silly that it's easy to think 'So what?' and after a while the format gets a bit samey. The fact is this is a very likeable and fun book that should entertain many readers.